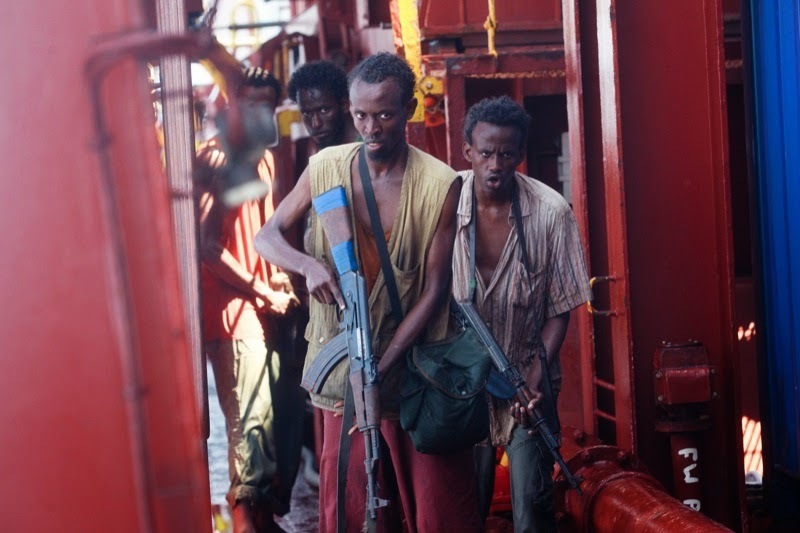 Captain Phillips (2013) is a film by Paul Greengrass, director of the first two sequels in the Bourne series, and based on accounts of a real Somali pirate attack in 2009. Captain Phillips talks with his wife about concerns for his children. He fears they will have trouble getting into the shipping business since it isn't as easy as it has been. She drops him off and we jump to him meeting his first mate and a few others. He stops the crew from taking a presumably long break. They also talk about how dangerous the pirates in the area are. He then receives a e-mail detailing the severity of recent pirate attacks. Meanwhile, the pirate Muse gathers a crew of a young local, a ship pilot, and a strong outsider. As you can tell by the summary, Captain Phillips has a long and tedious opening that goes through some of the life of a modern ship captain. Most notable are the three "dramatic e-mail reading" scenes that pretty much speak for the first act as a whole. It tries to humanize Phillips but only succeeds in making him seem boring. After that, we get the pirates attempting to board and some of the attempted humanization of them. They argue like everyone else! The pirates bicker and fight, but from these scenes comes the most interesting part of the film: Muse. This was the first act for me. 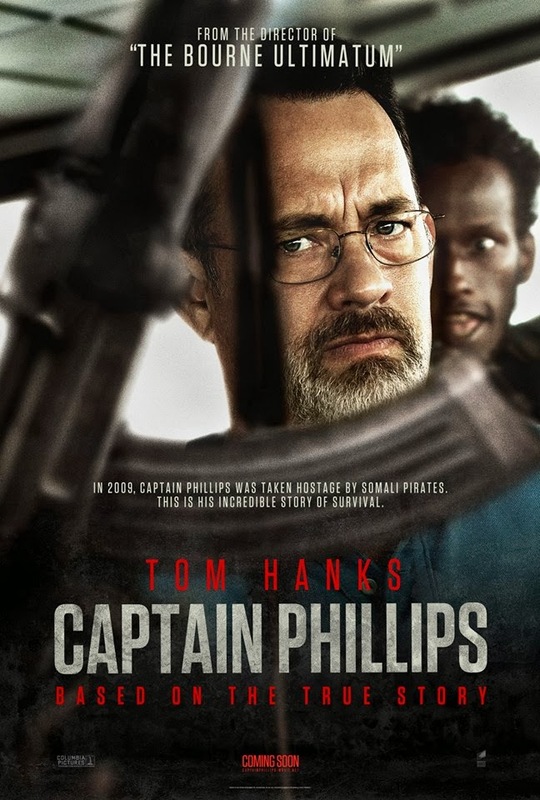 Captain Phillips is our titular hero; a man focused on his job who will do anything for his crew. Tom Hanks does a good job in this role, especially in the emotional scenes at the end. It is really the failing of the writing that tries to hard to equate him and Muse. Thus we're left with Phillips' suspenseful and dramatic sections mixed with the action of the military. It doesn't serve Hanks' performance very well. Najee is the most openly hostile and threatening pirate, Unfortunately, in a film of collected and intelligent individuals, he comes off as an oaf. He might kill Phillips, but even he seems to know that he can't. He's also not very interesting. He's a bully who wants to get paid. Abduwali Muse is the biggest reason to see this movie. His subtle plans are ruined by having to go in at half strength and some insubordination in his group. He then improvises to try to get the money he needs to live. His moments with Phillips are the best the film has to offer and the way the two men relate should have been the focus of the film. Barkhad Abdi should probably get best supporting actor for this role and it is to the film's determent that he's barely in the last act. This film makes life on a shipping boat look positively dull. It even makes the Navy look fairly dull. The split between action and suspense, mentioned earlier, manages to kill both. If the film had stuck to the suspenseful ordeal from Phillips perspective and played Phillips and Muse off one another as the main thrust of the plot, it would have been a far better film. Hanks cries, end text summary. My cousin predicted nearly word for word the sentence of the summary. The story in and of itself is not that compelling. Phillips has a weak 'true' storyline that makes me wonder why it's up for best adapted screenplay. Strong performances save some of the middle section of this film, but this film is far too much of an Oscar panderer to be terribly enjoyable. See it if you enjoy boats, Tom Hanks, or stories based on current events. Next Time: Best Picture Nom. Number 8.